Ethan & I had a tiring week, especially our trip to JB. My friend's car was broken in on Wednesday around 12.45am. We were sleeping very soundly that night till we received a call from the front desk manager. So my friend went down to check out the damages immediately. The left side window at the passenger side was smashed terribly. Our bags which only consisted of clinical papers, files and samples were stolen! We went to report the police and the whole process dragged us about 2.5hrs. How effective how police force is! By the time we reached the hotel, it was already 3.45am. Exhausted! We found a bit suspicious for the case. Firstly, we parked near to the main entrance. The parking spot was bright & it can be spotted easily by the Metro parking worker. Then, the hit by the thief was quite strong because it splashed to quite a distance. The strange thing is the Metro parking worker didn't even hear it! Besides, the last shift of the patrolling happened at 12.45am and 1am. How could the thief acted so fast right? I had my first lesson of Yoga on last Monday. As I am pregnant now, every pose that I do is simple and is modified to suit my body of two. If I recalled correctly, I have been taught on breathing technique, Dromedary Droop, Chest Streches, Kegel & also Pelvic Tilt. Though it is just an hour class, I pretty enjoyed the process. Especially towards the end of the relaxation pose, Caroline played a song, Grace & Gratitude by Olivia Newton John, my tears secretly rolled down my face. Why? Because the song is so touching and Caroline actually made quite a number of statements along with the song. Besides, I have suffering from quite a bad backache on Wednesday. I guess it was due to the lazy chair that I sat on in the afternoon. With such pain, I have no choice but to obey to the side sleeping position. Haha... Luckily, it really helped in easing my pain. Basically, I have had a peaceful week. Hopefully it shall be remained the same for next week as I will be away to JB for 3 days. Nowadays, I will try to schedule my checkup on Saturday. So, we went for our prenatal checkup this morning. It was indeed an excited one because we will know our baby gender later. Dr. Liu did the scan for me today. He checked on baby size, heartbeats & Nuchal Translucency. He also shown us baby's digestive system, bladder, spinal cord. Everything is normal and baby is growing healthily! See! He was lying comfortably there! Then it comes to the most interesting part! The gender! Our baby was hiding his / her private part from us again! Dr. Liu tried to play with our baby so that he can open up the legs a bit wider. He did! Guess what we saw? It is a active birdie in Mommy's tummy. Haha.... naughty boy! We tried to view him through 3D scan but it wasn't very clear. Can you see him? This little boy has been very active inside. He punches, kicks & even hiccups in there where ever and when ever he likes. Well, this mommy only increased 400gm this month. Dr. Liu assured me that as long as baby is growing, mommy's size is not really important. :) That's sound good right? Meaning I will have less weights to shed off after my delivery! Finally I have enrolled myself into the Prenatal Yoga class. I think I need some exercises. Since BB has gone up to KL to work, I have no more companion to go for swimming already. Hence, yoga is the best exercise I could think of. Tentatively the class will start on Monday. Then my instructor, Caroline will try to make another slot on Wednesday, if possible. It is a 1-1 teaching and I'm really looking forward to attend her class. She has been my Yoga Guru for many years. Though some of the students did complain that she is a strict, but she has managed to train us to be a discipline student. Hi our lovely baby, hope you enjoy yourself with Mommy ya! I'm into my 18 weeks of pregnancy now. Guess what? Our baby did a somersault in my tummy. The feeling was weird and yet it was an excited moment! Hubby was not around to share this piece of excitement with me. However, I shared it with him as soon as he returned from Guangzhou this morning. Unbelievable! He expression told me so. Hmm... my friends around me have started to ask whether I'm carrying a boy or gal. Some said that my waistline can still be seen, so it should be a boy. Some said it is a girl because my tummy is rounded. Haha... my friends, the result shall be revealed on next Saturday, ok.
Hey, remember that I complained of my belly itchiness last 2 weeks ago? Oh ya, it is getting better after I tried out Palmer's Cocoa Butter Formula Massage Cream for Stretch Marks. Sigh.... after few try, I only realised that this cream is suitable for me. Anyway, it is never too late! We both slept so soundly last night. After having our breakfast in the hotel, we ordered a Blue Bird Taxi to Rumah Mode. It costs about Rupiah 25,000 (RM 7). The price was pretty reasonable. Rumah Mode. Here we come. This is the most high class FO in the city. The outlet setup is beautiful. Do you feel like you are in Bali instead of Bandung? Anyway, the outlet is big. You can find many good quality branded items there; Burberry, Guess, J.Crew, Clavin Klein, Tommy Hilfiger, DKNY, Zara, Esprit, Abercrombie & Fitch, Old Navy, Ralph Lauren, Givency, Hermes, etc. We believe that the clothes there are authentic as you can see from the tag. Anyway, the fabric is very comfortable for the price we are paying for. The entrance to the food court. The stalls are clean & the staffs there are friendly. Yummy Satay. BB was surprised to see me finished up the lontong. Haha. How can I resist my favourite dish, Tahu Pong Gimbal Telur right? Nasi Ayam Penyet. Their chicken is so skinny even our Malaysia Kampung Chicken is losing out to it. Day 2 damage at RM 1150 for a total of 32 pcs of item. Since it was raining, we have no choice but to have our dinner in the hotel. We are the only guests there. Guess the food must be lousy then. Nasi Komplit. It was just ok only. After the dinner, BB thought of having a drink in their lounge. We hang around there for 15 minutes and no one came to serve us. Poor service! Anyway, the drink there doesn't look attractive and the tax is sky high, about 21%. Some highlights to those that plan to visit there. 2 nigths are more than enough if you are planning to go for shopping only. Do not need to waste your times going to all the FOs. 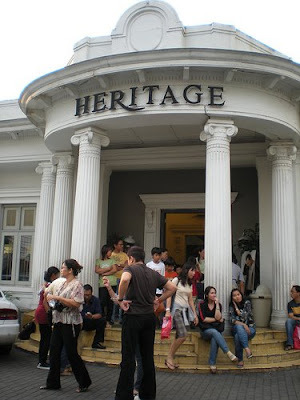 We recommend you to go to Heritage, Cascade, Secret and Rumah Mode will do. Bring along some instant noodles with you. You hardly can find any convenience store there. We booked our 2N stay at Grand Serela Hotel. The hotel's van picked us up from the airport. Great service, isn't it? This is the main entrance of the hotel. The location is very strategic because it is just a walking distance to the factory outlets. Our room is pretty big with a balcony. We paid Rupiah 1,785,000 (~RM 526) for 2 nights. After settling down our luggage, we surfed for the factory outlets in this street. We saw Heritage & Cascade. They are both next to each other. Actually both FOs are selling the same clothing except Cascade's ambiance is more cozy and comfortable compared to Heritage. This pond is located at the restaurant in Cascade. The Koi are extremely friendly. Just lay your hand towards them and they are more than happy to give u a big kiss. You can find many of this stalls along the street. We never even dare to try out the food. We rather hunt for their local food at Riau Junction Mall. Avocado Juice ordered by BB. My favourite Indonesia made "Tahu". Suzana loves this food. It is called as Bakso (Meat Balls Noodle). The noodle tastes something like our Wanton Mee. Not bad. Soto with Rice. It tastes so-so only. I think my MIL's Mihun Soto taste much much more better. One of the must visit FO. The interior is very modern. Too bad that we are not allowed to take picture inside. BB bought his French Connection & DKNY shirts from here and it is darn cheap. About RM 30 per piece. 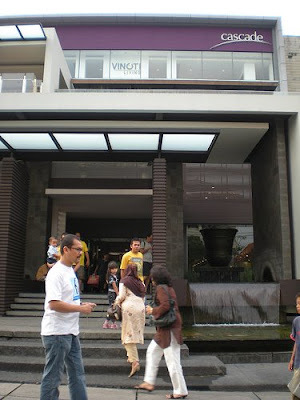 Besides, you can also find Nike, Guess, Timberland, Calvin Klein, Zara, Gap, Ralph Lauren, etc from this outlet. We also visited few other outlets but it was not worth going at all. The clothes look fake and the setup are messy. As I was feeling tired and exhausted, we returned to the hotel to take a nap. We couldn't find any places for food. Hence, we ended up having our dinner at Cascade. Avocado Juice & Melon Juice. The Avocado Juice tastes better compared to the one we had this afternoon. Guess this one is without the caremel. Nasi Bakar with Fried Chicken. Since we have not contributed our sales to Cascade & Heritage, we continued to shop at both outlets after our dinner. Well, if you are at Martadinata (Riau), we will suggest you to visit only this 3 outlets. That's it. Don't waste your times exploring the rest of the FOs. So these are our winning items for the day. Our damage for the day was about RM 345 for a total of 18 pieces of clothing. The moment I see this outlet, I was like "Whoa! It is my heaven!" Haha.... there are so many choices of "Asam". As we walked along row by row, we also tried out the "Asam" one by one. It was so fun! Are you ready to go into this cuttle fish room? Besides the "Asam" & cuttle fish, they also have different types of marshmallow and candy. Can you see the one in blue is lining up at the counter? Hehe... it is my Hubby B. He is paying for the cuttle fish! Anyway, it is worth popping in to this shop if you are a tibits lover like me.